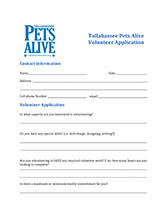 Formed in January 2012 by a small group of volunteers in the Tallahassee area, Florida Pets Alive (FPA) is a non-profit organization dedicated to making Leon County, Florida a No-Kill community. 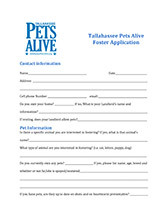 Following the 11 steps of the No- Kill Equation, and the proven practices and programs of Austin Pets Alive, our goal is to work with the Tallahassee Animal Service Center, rescue groups, and the citizens of Tallahassee to help save and improve the lives of lost and homeless pets. 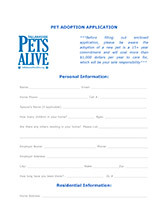 We can and will make Leon County a No-Kill community! It is our goal to make Leon County a community where no adoptable pet or feral/un-owned cat is killed regardless of resources, economics, or politics.